I was going to leave this one alone but, I just can't. The primary in Michigan is a joke. It is meaningless for the Democratic Party and can only be a source of mischief for both disaffected Republicans, Independents, and goofy Democrats. If I were back home, I would be tempted to join the mischief makers. In 1972, Republican voters in Michigan decided to make a little mischief, crossing over to vote in the open Democratic primary and voting for segregationist Democrat George Wallace, seriously embarrassing the state's Democrats. In fact, a third of the voters (PDF) in the Democratic primary were Republican crossover votes. In 1988, Republican voters again crossed over, helping Jesse Jackson win the Democratic primary, helping rack up big margins for Jackson in Republican precincts. (Michigan Republicans can clearly be counted on to practice the worst of racial politics.) In 1998, Republicans helped Jack Kevorkian's lawyer -- quack Geoffrey Feiger -- win his Democratic primary, thus guaranteeing their hold on the governor's mansion that year. Michigan Democrats helped deliver their state to McCain in 2000 to spite their hated governor, John Engler, who had "guaranteed" his state to Bush. So, Daily Kos is supporting a Michigan Democrats for Mitt primary election ploy. And, I must admit, I LIKE IT!!! Romney is a phony. He is pandering to whomever will listen to him. His liberal and centrist past have been ignored as he CHANGES his political positions just to get support from the Republican base and other Christianists. Screw his Michigan roots. 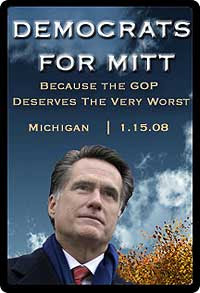 Mitt is no George Romney and does not deserve anyone's support in Michigan.